What's eBay Like for Buyers These Days? Soon after 2008 began, eBay unleashed what seemed to be a tsunami of changes to the site. Those changes werealmost without exceptiongeared toward "improving the buyer experience," although they seemed to have the greatest impact on sellers. "I know that many of you have seen a lot of change over the past six months, and for some it hasn't been easy," noted Lorrie Norrington, president of eBay's Global Marketplaces operation, in a mid-year message to sellers. "People simply expect more when they come to eBay... and it's our job to make sure we meet their expectations." By now, we've all lived with the fallout from those changes. And perhaps, as the holiday season passes, now is a good time to examine the results. Are eBay buyers experiencing an improved shopping environment? What can dedicated sellers learn from this new buyer experience to make their businesses more efficient and safeguard their DSRs? eBay set out to deal with some very specific problems with buyers' perceptions of the site. One of the biggest issues was fraud. Frightened buyers often behave badly, and a perceived dangerous "neighborhood" can't retain its shopping appeal for long. Even though fraud was at least as much of a concern for sellers as it was for buyerswith sellers actually having more to lose through fraudulent transactions than buyersthat's not the story the media usually picked up on. Nevertheless, eBay set out to improve its image to buyers. eBay also wanted to streamline the search ("find") function on the site and find a way to compete with other online markets (think big South American river) that offer guarantees and easy, free shipping. These are things buyers said they needed, and eBay took these complaints not only to heart but also directly to sellers. The expectation was, "This is how we think we can fix it, and here's what you have to do." With these goals in mind, let's see where the chips have actually fallen. We'll start with some good news. Recent discussions on eBay's PowerBuyer's board suggest that some buyers are beginning to understand the importance of giving sellers a five-star rating whenever possible. These buyers have seen the consequences of lower ratings. Realizing that low DSRs can eliminate even competent and dedicated sellers has helped boost the level of support buyers feel responsible to offer. So evidence suggests that sellers have been successful in educating buyers about what those DSRs really mean. We had a long chat with Jim "Griff" Griffith, eBay's avuncular spokesman, about buyers' concerns and the changes they spurred. He explained that DSRs are not that cut and dried and a seller restriction is not the same as a seller suspension. When one of a seller's DSR ratings slips below 4.3, Griffith says, "Their listings are not taken down from the site; they just can't list new items 'til the DSR goes up." The rolling scale on which the 30-day average is based changes every day for every seller. Thus, explains Griffith, "The DSR can be countered by current inventory. In most cases, if someone with a lot of inventory is restricted, that restriction will last no more than a day." This is, of course, eBay's perception of the DSR experience. It may or may not reflect every seller's perception. Griffith also touted the Best Match search feature that is now the "flagship of our new search engine," he says. "Lots of buyers told us they were not satisfied by the overwhelming number of search results. Some of these were inappropriate or not correct. Now, you can search for an iPod Nano and get only the Nano, not Nano accessories." Griffith further reminds us that, in the background, the Best Match search rewards sellers with high DSRs. With everything else being equal within the listings, the seller with the highest DSR will appear first in the results list. Although this process is transparent to buyers, it's still a reward for more trustworthy sellers. But, not only did Griffith share the buyer feedback behind some of this year's new changes, he also offered glimpses into what buyers and sellers can expect in the months to come. Perhaps the best news is that in the fall, PayPal began offering a 100 percent money-back guaranteewithout limiton every item paid for with PayPal. "Even a $50,000 Mercedes?" we asked. Yep, even a Mercedes. If a buyer pays with PayPal, the guarantee stands. This will help calm the nerves of anxious buyers all over eBay. In addition, Griffith explains that eBay will streamline the checkout process by eliminating paper payments. PayPal, ProPay or a merchant credit card account will be the only payment options sellers may mention in a listing. When the new payment policy is completely in place in January 2009, a seller will not be permitted to solicit payments through checks or money orders, for example. Sellers won't even be able to state that payment through a check will result in holding the item until the bank clears the check. 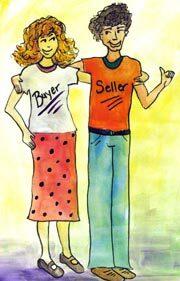 However, if a buyer contacts a seller directly and asks to pay with either of these paper payment options, the seller will not be prohibited from accepting those forms of payment if he or she chooses. The perceived security of the PayPal guarantee and the processing of payments only through credit cards should do even more to assure nervous buyers they can shop safely on the site. Before the changes eBay put into place this year, the number of active buyers had been slipping from quarter to quarter, Griffith notes. "Now, we're seeing some ticks that suggest things are getting better for buyers," he says. "We're looking at the situation and can say at least we've halted what was something quite discouraging." As for sellers? "You've seen, on the policy side, the bulk of whatever changes were necessary to refocus and steer this big ship to protect buyers and improve things for sellers by having more buyers on the site," Griffith says. Further, he says that in the coming year, eBay will work to eliminate the unpaid items problem that has plagued the lives of eBay sellers. "We're working on eliminating it completely," he notes. "We are determined to do this." All efforts, he promises, are focused on a smooth, consistent, and safe transaction model that will virtually eliminate unpaid items. For fixed-price listings, this will include a shopping cart checkout. For the auction format, this will mean money will be automatically taken from the highest bidder's account or credit card and put into the seller's account. "In 2009," Griffith predicts, "sellers will absolutely be able to say that 2008 was really tough, but that eBay made things easier with new tools and other changes. This is a huge, monumental campaign, but anecdotally, we are seeing buyers that are happier. Sellers will realize some initial benefits right now, but the overall marketplace will recognize that these changes have been all to the good." We're not much for predicting the future, but we'll be watching closely to see if sellers are able to agree with Griffith's optimistic forecast once 2009 actually comes and goes. Use KickItBack's rebate program to earn cash back for you and your buyers. Largest eBay sellers' group feels a sense of betrayal. What's Ahead for eBay and You? Merchant group aims to help the site restore its brand value. Can You Still Get Good Deals on eBay? Site's changes net mixed reviews from bargain hunters. To ensure 5-star customer satisfaction, think like a buyer. Snipers: Online Assassins or Sellers’ Allies? Gain a sales advantage by understanding the sniper’s role. eBay revises rules for certain categories and enforces return policy. Searches for the auction site increase 20% during April. eBay will enable analysis of DSR performance. Auction giant sees first quarterly decline in almost 10 years. Site adds more than 60 online stores to its cash-back program.